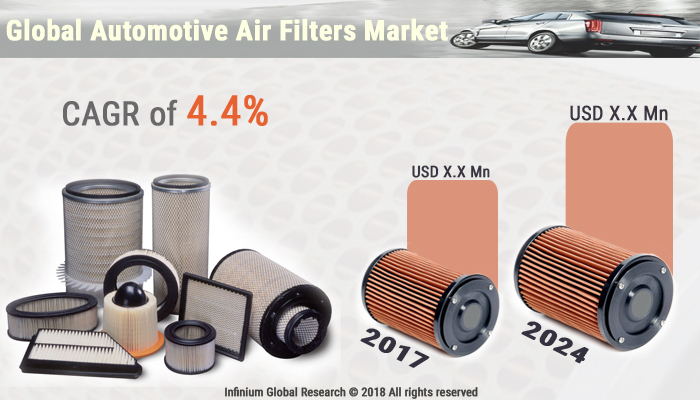 A recent report published by Infinium Global Research on automotive air filters market provides an in-depth analysis of segments and sub-segments in the global as well as the regional automotive air filters market. The study also highlights the impact of drivers, restraints and macro indicators on the global and regional automotive air filters market over the short term as well as long term. The report is a comprehensive presentation of trends, forecast and dollar values of the global automotive air filters market. According to the report the global automotive air filters market is projected to grow at a CAGR of 4.4% over the forecast period of 2018-2024. The automotive air filters are pleated paper filters that are placed outside-air intake for vehicles’ passenger compartments. Air filters are being used in applications where air quality is of vital importance, particularly in building ventilation systems and in vehicle engines. The automotive air filters are designed to prevent adverse debris from entering any parts where air and fluid flow, including your engine, radiator, fuel lines and more. The combustion of the automotive air filter can cause oil contamination and mechanical wear. Hence the filter restricts the particular matter to enter into the automotive air filters. The rapidly growing automotive industry is the key factor driving the growth of the automotive air filter market. Additionally, growing environmental pollution awareness is anticipated to boost the demand of automotive air filter market over the forecast period. Wide-ranging and transformative changes in the automotive industries contribute to the growth of the automotive air filter market. However, the booming electric vehicle market is restraining the growth of the air filter market. Moreover, the use of non-replaceable filters is likely to create a negative impact on market growth. Entry of dirt particles can damage the engine walls, cylinders, pistons and piston rings, which may lead to reduced engine life. Furthermore, ongoing advancements in the filter technology are creating huge growth opportunities for the key players in the automotive air filters market significantly. The global automotive air filter market is highly competitive. Among the geographies, Asia Pacific is the largest as well as the fastest growing region in the in the air filtration market. Increased production of passenger cars, new technological developments and increased demand for two-wheelers from countries such as China and India are driving the growth of automotive air filter market. In addition, lower-cost labor and rapidly growing automotive industry are expected to contribute in the growth of automotive air filter market in the Asia Pacific region. The report on global automotive air filters market covers segments such as type, vehicle type, and sales channels. On the basis of type, the global automotive air filters market is categorized into engine air filters, oil filters, fuel filters, cabin air filters, and emission valve and filter. On the basis of vehicle type, the global automotive air filters market is categorized into passenger vehicles, commercial vehicles, and electrical vehicles. On the basis of sales channels the global automotive air filters market is categorized into OEMs and aftermarket. The countries covered in the North America region include the U.S., Canada, and Mexico; while the Asia-Pacific region includes countries such as China, Japan, India, South Korea, Malaysia, and among others. Moreover, Germany, U.K., France, Spain, and Rest of Europe are the major markets included in the European region. The U.S. drives the growth in the North America region, as it is the largest market in the region. In the Asia-pacific region, rapid industrial growth in India and China offer a substantial potential for the growth in the automotive air filters market. As a result, the APAC region is projected to experience a growth at a CAGR of x.x% over the forecast period. The report provides profiles of the companies in the global automotive air filters market such as Sogefi SpA, TOYOTA BOSHOKU CORPORATION, Valeo, ROKI Co. Ltd, MANN+HUMMEL, MAHLE GmbH, Lydall, Inc, DENSO CORPORATION, Cummins, CLARCOR Inc. The report provides deep insights into demand forecasts, market trends, and micro and macro indicators. In addition, this report provides insights into the factors that are driving and restraining the global automotive air filters market. Moreover, IGR-Growth Matrix analysis given in the report brings an insight into the investment areas that existing or new market players can consider. The report provides insights into the market using analytical tools such as Porter's five forces analysis and DRO analysis of automotive air filters market. Moreover, the study highlights current market trends and provides forecast from 2018-2024. We also have highlighted future trends in the automotive air filters market that will impact the demand during the forecast period. Moreover, the competitive analysis given in each regional market brings an insight into the market share of the leading players. This report will help manufacturers, suppliers, and distributors of the automotive air filters market to understand the present and future trends in this market and formulate their strategies accordingly.